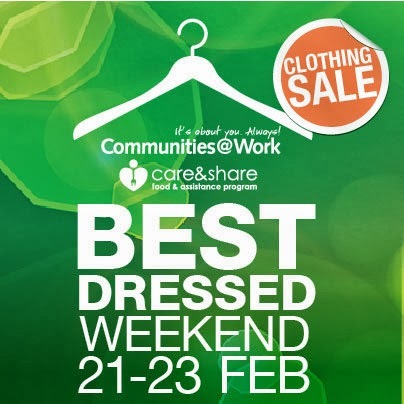 Communities@Work, a local Canberra community organisation, is holding a a Clothing Sale of top quality nearly new women's clothing with prices starting at $5 on February 21-23. All proceeds of the sale will support their program Care&Share, which provides food and essential services to individuals and families in Canberra who are experiencing hardship. The program supports over 1,000 families right across Canberra. More information about the event can be found on their website. Total outfit for $11? ...only from an op shop! Sometimes I find gold and on my last day before heading back to work, I scored gold. I headed out to Salvo's in Fyshwick as I hadn't been to the southside of town for a while and in particular to Fyshwick. Being a weekday it was quiet and there wasn't a queue for the change room. I'm on the hunt for a crop demin jacket. Do you think I found one? No, but of course I couldn't leave empty handed. 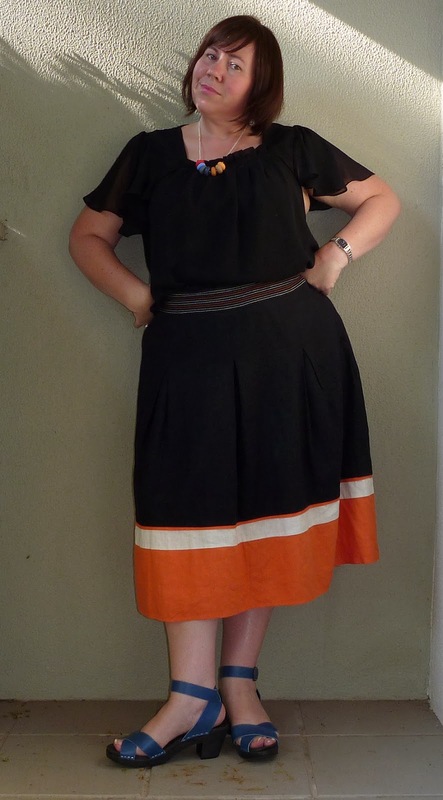 On the half price rack was a linen Marks and Spencer skirt for $3. 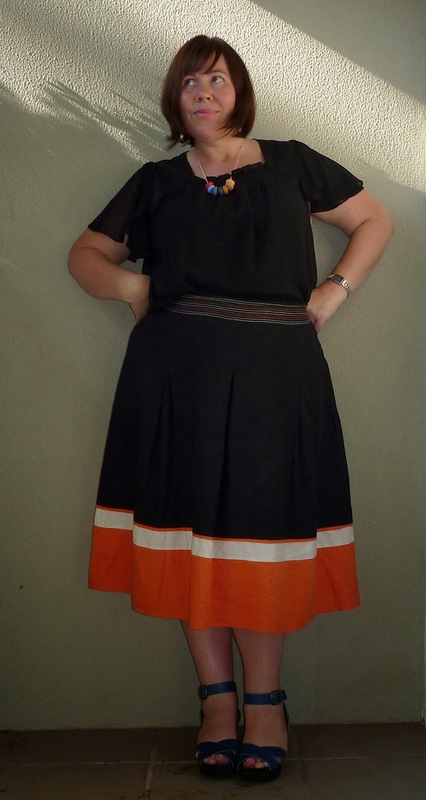 I love the black with the cream and peachy colour block hem. Not one to usually look at the shoes today I did. And thank the op shopping stars I did! 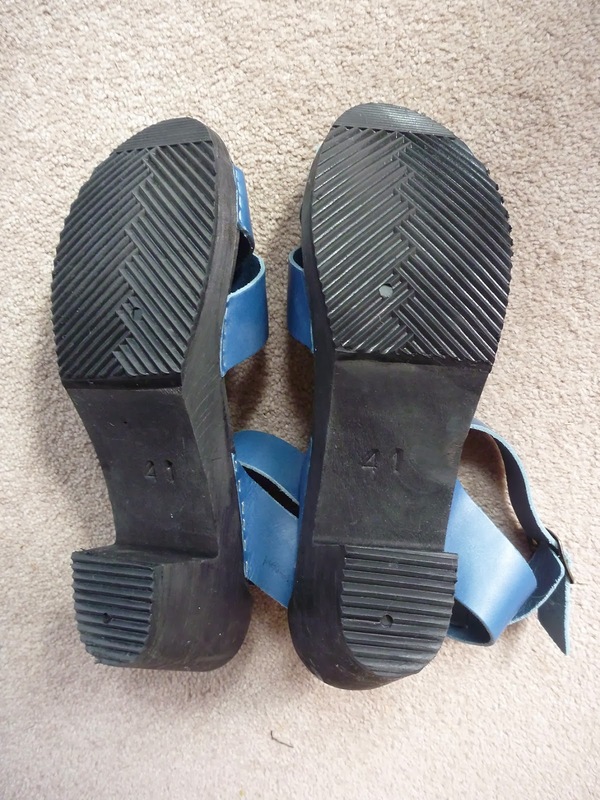 Funkis clogs $5, in size 41? Yes please! And they look brand new! The thought of ironing work clothes does not thrill me, so during my first week back at work I headed into Vinnies Mitchell, picking up a cute, cool, non iron Liz Jordan top for $3. 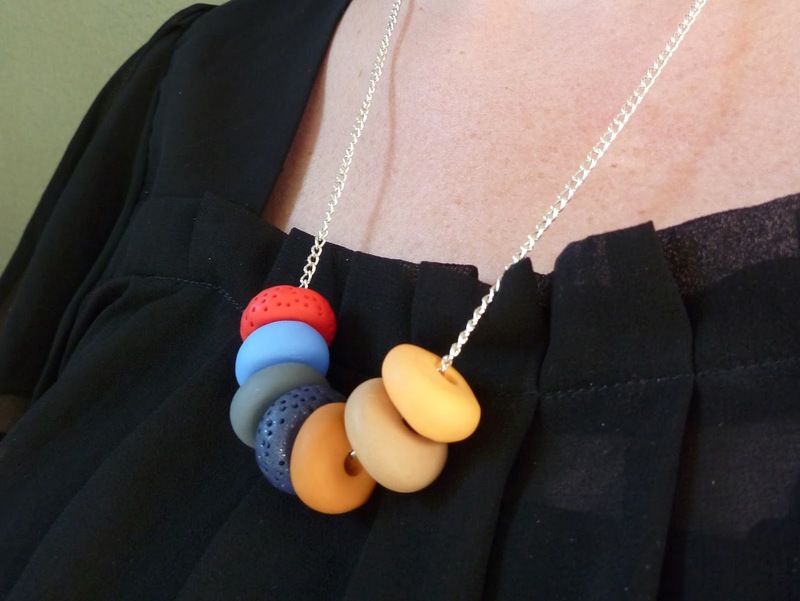 And to finish off my bargain $11 outfit, a handmade necklace, made by my darling friend Libby. If I enter an op shop with something in mind, I always come out with more than anticipated. I went in today to buy ice cube trays. I got them... along with a few other things. Two Ikea ice cube trays for $3 each. I'm sure they are actually cheaper at Ikea, but hey, I'm giving to a charity and it's cheaper (and quicker) than a trip to Ikea in Sydney, so I'm not complaining. I also got a pink silicon Masterchef Muffin tray for $3, which I will also use for ice cubes for punch bowls or jugs of iced tea. Brand new, still with the tags on, a Virtu Janey cardigan in dark gray for $15. Although it is the middle of Summer, this will be a great edition to my wardrobe in Autumn or Winter. The cardy has large press studs down the side, so it means it can be worn numerous ways. As it's too hot to take photos in a knitted vest, here are some photos from the Virtu site.